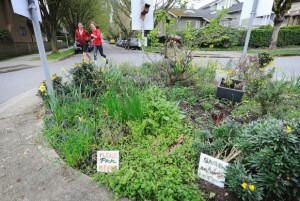 My roundabout garden at 6th and Trafalgar in Kitsilano (Vancouver,BC) has recently had its 15 minutes of fame. First of all, a journalist who lives in the neighbourhood wrote a piece about it and “Mary Whoever-You-Are” (that’s me!). And then CBC TV did a piece for Earth Day featuring myself and fellow Green Streets Gardener Elayne Armstrong (Broadway and Balsam). But is it art??? you ask. And yes, I answer, in several ways. 1. Gardening is an art – period. 2. I have a bird art sculpture made for Worldwide Bird Art Installation Day in my garden. Someone has left a metal lizard and a hat for the bird. 3. I also have two artful mason bee houses. 4. Open Source Landscaping – a phrase coined by Oliver Kellhammer to describe a public area where the gardener/artist allows or encourages things to unfold. I’m not as out there as Oliver is and I took out the corn plants that were put in last year. 5. Botanical Intervention – another phrase from Oliver Kellhammer – plants put into an urban setting that “intervenes” in the habitual ways of people. 6. Relational Aesthetics – this little piece of ground encourages relationships. I love the idea that I don’t know all of what happens there and if people know me at all, they know me as “Mary Whoever-You-Are”. Click the photo at top for the Vancouver Sun article and here for the CBC TV news segment.